La edición estadounidense de la revista Rolling Stone ha publicado la lista de las 100 mejores canciones de lo que va del siglo XXI. En ella se encuentran grandes éxitos como 'Despacito' de Luis Fonsi, que llegó a ser la canción con más reproducciones en Youtube y 'Gasolina' de Daddy Yankee. El puesto 91 es para el artista puertorriqueño Luis Fonsi con su tema de 2017, que también contó con la colaboración de Yankee y Justin Bieber, en su versión inglesa. Gasolina, por su parte, se posiciona en el número 100, cerrando la lista. El primer puesto es para Beyoncé con su tema 'Crazy in Love', en el que colaboró su marido Jay-Z. No es el único tema de la artista, ya que cuenta con otros dos en la lista: 'Single Ladies' en el número 51 y 'Formation' en el puesto 38. La lista está repleta de artistas de diferentes géneros musicales desde Amy Winehouse hasta David Bowie, pasando por Lady Gaga o Snoop Dog con su tema 'Drop it like it's hot'. Como explica la revista en su publicación "nuestra lista puede parecer un poco diferente, pero el resultado es un excelente reflejo de un período increíble en la historia de la música". 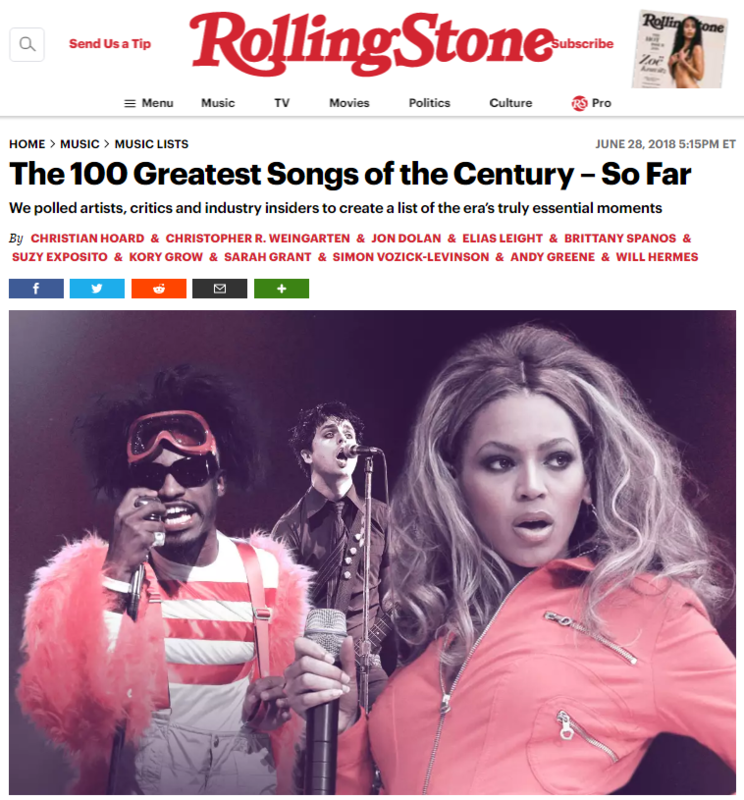 完整榜单（The 100 Greatest Songs of the Century – So Far）： 100. Daddy Yankee feat. Glory – "Gasolina"
99. UGK feat. Outkast – "Int'l Players Anthem (I Choose You)"
98. Alvvays – "Archie, Marry Me"
96. The Black Keys – "Tighten Up"
95. Kylie Minogue – "Can't Get You Out of My Head"
94. Kanye West – "Jesus Walks"
93. My Chemical Romance – "I'm Not Okay (I Promise)"
92. Parquet Courts – "Stoned and Starving"
91. Luis Fonsi feat. Daddy Yankee and Justin Bieber – "Despacito (Remix)"
90. Amerie – "1 Thing"
89. The Hives – "Hate to Say I Told You So"
88. Vampire Weekend – "Hannah Hunt"
87. Mariah Carey – "We Belong Together"
86. Icona Pop w/Charli XCX – "I Love It"
85. Original Broadway Cast of "Hamilton" – "My Shot"
84. Daft Punk – "One More Time"
83. Beck – "Lost Cause"
82. The Shins – "New Slang"
81. Gwen Stefani – "Hollaback Girl"
80. M.O.P. – "Ante Up (Robbin-Hoodz Theory)"
79. Snoop Dogg feat. Pharrell – "Drop It Like It's Hot"
78. Peter Bjorn and John – "Young Folks"
77. LCD Soundsystem – "Losing My Edge"
76. Daft Punk feat. Pharrell Williams – "Get Lucky"
75. Miranda Lambert – "The House That Built Me"
74. The New Pornographers – "Letter From an Occupant"
73. The Rapture – "House of Jealous Lovers"
72. Migos – "Bad and Boujee"
71. Carly Rae Jepsen – "Call Me Maybe"
70. Green Day – "American Idiot"
69. Frank Ocean – "Thinkin Bout You"
68. Eric Church – "Springsteen"
67. T.I. – "What You Know"
66. Nicki Minaj feat. 2 Chainz – "Beez in the Trap"
65. Rihanna feat. Calvin Harris – "We Found Love"
64. Kendrick Lamar – "DNA." 63. Fall Out Boy – "Sugar, We're Goin Down"
62. Katy Perry – "Teenage Dream"
61. Madonna – "Hung Up"
60. Haim – "The Wire"
59. Cardi B – "Bodak Yellow"
58. Jay-Z and Kanye West – "Ni**as in Paris"
57. The Flaming Lips – "Do You Realize??" 56. Radiohead – "Weird Fishes / Arpeggi"
55. Azealia Banks feat. Lazy Jay – "212"
54. Rilo Kiley – "Portions for Foxes"
51. Beyonce – "Single Ladies (Put a Ring on It)"
50. Coldplay – "The Scientist"
49. Harry Styles – "Sign of the Times"
48. Pharrell Williams – "Happy"
47. Childish Gambino – "Redbone"
46. Justin Timberlake – "Cry Me a River"
45. Justin Bieber – "Sorry"
43. Solange – "Cranes in the Sky"
42. MGMT – "Electric Feel"
40. U2 – "Beautiful Day"
39. Queens of the Stone Age – "No One Knows"
37. Leonard Cohen – "You Want It Darker"
36. Kanye West feat. Jamie Foxx – "Gold Digger"
35. Lana Del Rey – "Blue Jeans"
34. The Killers – "Mr. Brightside"
32. 50 Cent – "In Da Club"
31. Arcade Fire – "Wake Up"
30. Bob Dylan – "Mississippi"
29. Taylor Swift – "All Too Well"
28. Rihanna feat. Jay-Z – "Umbrella"
26. Drake – "Hotline Bling"
25. Mark Ronson and Bruno Mars – "Uptown Funk"
24. Eminem – "Lose Yourself"
23. Outkast – "Ms. Jackson"
22. Franz Ferdinand – "Take Me Out"
21. Lady Gaga – "Bad Romance"
20. Amy Winehouse – "Rehab"
19. Robyn – "Dancing on My Own"
18. David Bowie – "Blackstar"
17. Missy Elliott – "Work It"
16. LCD Soundsystem – "All My Friends"
15. Gnarls Barkley – "Crazy"
14. Britney Spears – "Toxic"
13. Kendrick Lamar – "Alright"
12. Missy Elliott – "Get Ur Freak On"
11. Kelly Clarkson – "Since U Been Gone"
10. The Strokes – "Last Nite"
8. Adele – "Rolling in the Deep"
7. Kanye West – "Runaway"
6. Yeah Yeah Yeahs – "Maps"
5. Jay-Z – "99 Problems"
4. OutKast – "Hey Ya!" 3. The White Stripes – "Seven Nation Army"
2. M.I.A. – "Paper Planes"